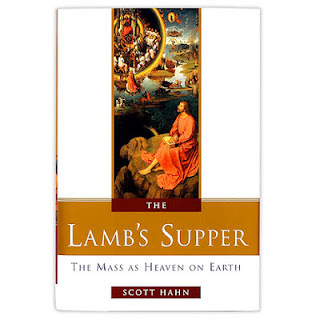 The book, "The Lamb's Supper - The Mass As Heaven On Earth" by Dr. Scott Hahn is a must read for every Catholic as well as those interested in learning about the Biblical symbolism found in the Mass. This book was one of the first that I read when I was an atheist. It gave me a deep look into the Mass from an intellectual perspective at first, and then a spiritual one when I read it again as Catholic. Dr. Hahn is a convert from Protestantism. He was a Presbyterian minister and teaches Theology and Scripture at Franciscan University in Steubenville, Ohio. 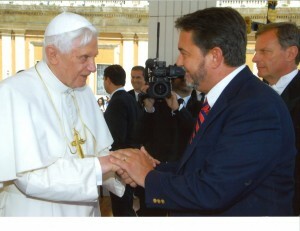 Dr. Hahn is also a regular of EWTN. He is a very brilliant theologian and presents Theology and Scripture in a manner that anyone can understand it. This book can be read and understood by anyone. In this book, Dr. Hahn connects the imagery found in the Book of Revelation with the Mass. He shows how the Mass is the "Lamb's Supper" mentioned in Revelation 19:6-9. Dr. Hahn cites both the Old and New Testament, as well as the Church's teachings and Fathers. The book is well organized and to the point. Dr. Hahn presents the Mass as it should be seen in the minds and hearts of Catholics. The Mass is the Lamb's Supper where the angels and saints (Church Triumphant) unite with those participating on Earth (Church Militant). Heaven unites to every parish, chapel or place where Mass is said. After reading this book, you will not see the Mass in the same manner as before. If you are used to the repetition and physical movements that sometimes become mechanical, then this book will change your perspective. The Mass is not just as "ritual" where we respond and move around like automatons. It is the perfect prayer where Christ the Lamb is present, offered to God and unites with us in the Holy Eucharist. If you have not read this book, I recommend it 100%. This is a book that should be on shelves in rectory/seminaries libraries, and Catholic homes. Protestants who think the Mass is a Papal-made invention should read this book. In this year of Faith, it is a great resource to use in order to prepare for Mass and grow spiritually by dwelling more into the Theology and Scripture behind every aspect of it.